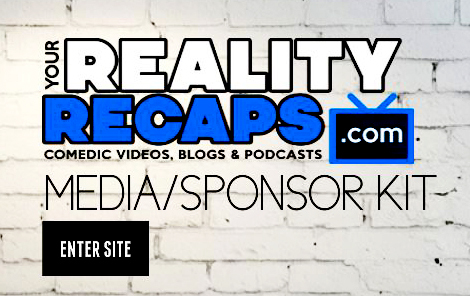 This week on Survivor… After they return from Tribal Council, Spencer thanks the rest of the Ta Keo tribe and promises that he’s not going to run around camp strategizing; it’s all about the tribe and personal relationships now. If he can make the change that he knows is within him, he still has a chance. Terry is super proud of himself for having a social game and super happy that he’s gone from the bottom to the top. He’s on top the world. 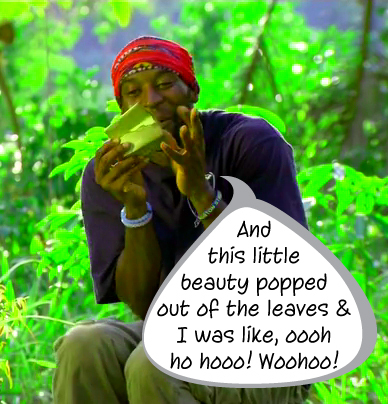 They still have Spencer to vote out if they have to go to the next Tribal, but life is good… The next day both tribes meet up with Jeff and he does a little talking about how the tribes feel about their tribes – everyone is feeling great about their tribes – then Jeff tells them to drop their buffs. It’s tribe-switchin’ time! Of course, everyone drops their jaws along with their Buffs. Spencer looks disappointed, but his reaction should be more like Stephen’s because Spencer has a shot to form some new alliancships – you know, relationships/alliances – that aren’t planning to vote him out next time they go to Tribal. 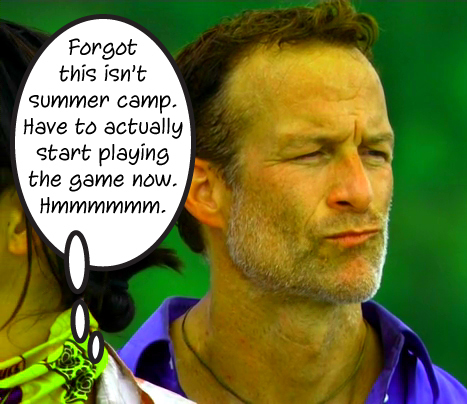 Then Jeff drops another bomb: they will switch from two tribes to three with six players each and one tribe will have to go to a whole new beach and build a whole new camp. 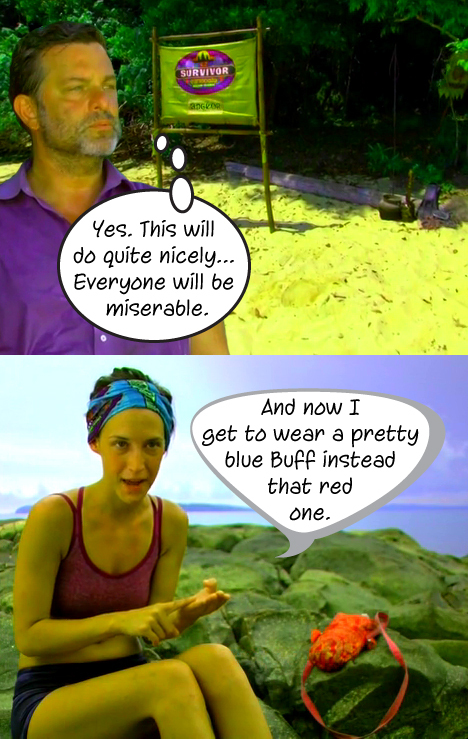 No one is excited about this at all and Savage is scared, not about building a new camp, but because tribe switches haven’t really done him any favors in the game of Survivor. After Jeff reveals wicker boxes containing new Buffs, each person grabs one and the new tribes are revealed. On the new Bayon tribe: Jeremy, Monica, Stephen, Borneo Kelly, Spencer, and Kimmi. On the new Ta Keo tribe: Keith, Kass, Joe, Ciera, Terry, and the other Kelley, which leaves Savage, Woo, Peih-Gee, Varner, Tasha, and Abi on the new tribe, Angkor. Joe is really happy with his new tribe; all their girls are stronger, all their guys are stronger and he thinks they will be able to take control of the game. Savage is overwhelmed, he’s in the minority with his new tribe, they have to build a new camp – it’s devastating. At the new Bayon, it’s a lot like the old Bayon except they have two easy votes in Spencer and Borneo Kelly from the old Ta Keo tribe. Stephen couldn’t be happier. He’s not on Camp Macho anymore. Spencer is happy to have the opportunity to play a more social game and connection with people emotionally; he’s trying to have feelings. So, Spencer opens up to Jeremy about his relationship with his girlfriend, Jeremy thinks Spencer is a good dude, he’s funny, and he’s happy to have a personal conversation with him. He’ll be good to have around in the game. Back at Angkor, it’s raining and everyone is pretty miserable. This is just round two for Tasha, she experienced all this in her first game of Survivor. Tasha has also noticed the divide between Peih-Gee and Abi and she opts for talking to Abi about voting with her and Savage. Abi doesn’t know what to do. She wants to go to the end this time, but Ta Keo wants to remain Ta Keo strong. The next day Varner, Savage and Tasha are talking out in the jungle; Savage and Tasha are promising Varner a spot on the Jury if he votes with them. Isn’t that lovely? Jeff is very nervous about Savage and Tasha. They are out and about talking to everyone and they could be making the same promises and deals with the others. Back to Bayon, Stephen has infected the rest of the original Bayon members with Idol Fever. They are all out looking for the hidden Idol. Monica and Stephen are having no luck, staring up into the trees isn’t doing Kimmi any favors, and Jeremy is in the jungle by himself, poking around in trees. 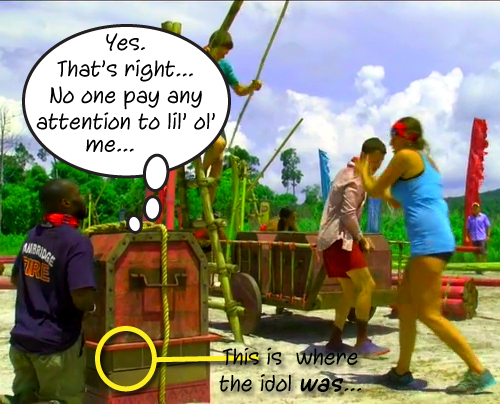 And just like that *snap*, Jeremy finds the CLUE to the Idol – his idol – will be on the third box in the next Immunity challenge. Jeremy doesn’t know how he’s going to do it, but he wants that Idol bad. Time for Immunity! Each tribe will drag a cart through an obstacle course and retrieve keys to obtain a chest. After collecting all three chests, the cart must be taken apart, transported through a barricade, then reassembled and dragged through the final obstacle where two members of each tribe will solve a three section puzzle from the pieces in each of the three chests. This is the first challenge of Cagayan and each tribe has a member of the Brains tribe that failed so miserably to win this one. Two will be redeemed, one will not! And Jeremy is pumped and ready to get that idol. And GO! Jeremy is quick to position himself as the key-catcher and thus, the person who uses the key to release the chests. Ta Keo takes an early lead as the first tribe to have all three chests. As Bayon reaches their third and final chest, Jeremy pushes Kimmi out of the way to catch the key, then kneels down, grabs the idol, pushes it down his pants, then pops back up ready to use the key. Bayon is next to reach the barricade with Angkor not far behind them. Ta Keo’s lead, though, has been helpful. They are already working on reassembling their cart and as soon as Jeff says they are good, they get to work clearing away the obstructions in the final leg of the obstacle course. Bayon gets to the puzzle station not long after Joe and Kass have begun putting the first section of the giant circle puzzle together. Angkor is nipping at Bayon’s heals, though. Spencer and Monica have taken the puzzle reigns for Bayon; Tasha and Peih-Gee are tackling it for Angkor and they have made quick work of the first section, joining Kass and Joe who are already working on it and quickly move on to the third and final section – They finish first, leaving Bayon and Angkor to battle it out for the second Immunity idol, but Jeremy and Spencer are working very well together and it’s not long before they finish, claiming the second idol for Bayon. Angkor will go to Tribal Council. So… After the challenge, before they have reassembled on their starting mats, Varner tries to communicate with Borneo Kelly, but Tasha sees him and is quick to jump in front him to cut off the visual link saying “We’ve got a rat”. After Jeff hands out the Immunity Idols, he of course takes a moment to address the altercation. Varner says he barely said anything to Kelly before Tasha freaked out on him. He made deals with her and Savage and then they turned around and made a deal with “her”, whom I assume is in reference to Peih-Gee. Savage says he’s wrong about that. This shakes Woo’s confidence because he knew nothing about any side deals being made with the people on his tribe AAAND it’s time to go back to camp! Varner knows he’s in trouble and Savage couldn’t be happier. He thought for sure he was a goner, but after Varner’s little outburst, things are looking better for him. By the well, Savage pleads his case to Woo and Peih-Gee – the challenges are going to be physical and they need him. Abi tells Tasha that she will totally vote out Varner, then she let’s Woo and Peih-Gee know that she’s voting with Savage and Tasha because she knows she’s on the bottom of the Ta Keo alliance. This fuels Peih-Gee to go to Savage and Tasha to let them know that she now wants Abi gone, but this backfires because Savage finds Abi and lets her know that he and Tasha will be voting for Peih-Gee since she is targeting Abi… Varner tells Abi that he is on board to oust Peih-Gee, it keeps him in the game so he’s game for that. Tasha tells, Woo and Peih-Gee, though, that they are voting Abi, giving herself and Savage all the power they need to send home the woman of their choice. Bravo, Tasha and Savage. Brilliant play.